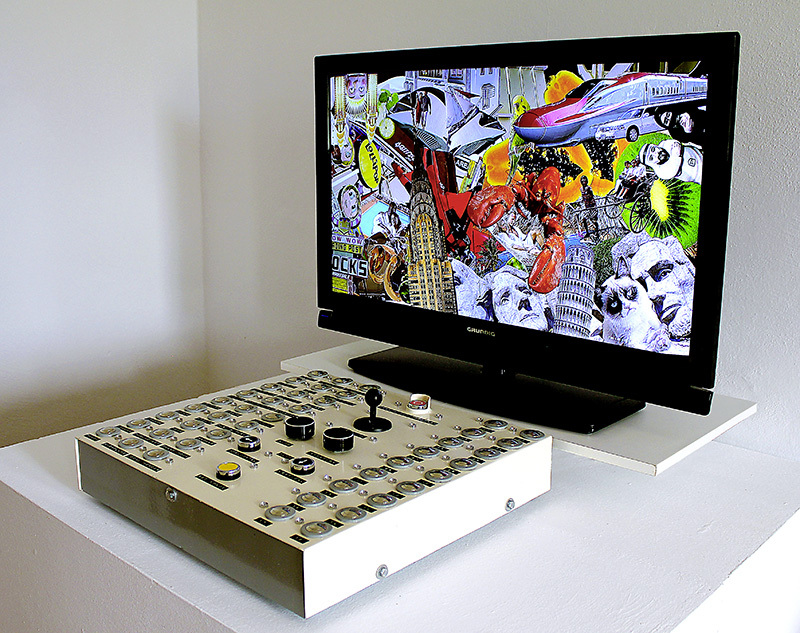 The Paradiseator is an image mixing console with an industrial retro look. By combining open source technology with the legacy of Dada and Fluxus the user of the apparatus can choose among 486 cliché pictures and arrange them according to his personal paradise gaze. This action dissects the promised metalife and reassembles it in a weird way. An ambiguous hyperreality questions in a playful and ironic way the creation of consumer needs and their influence on the perception of the world. The interface has 49 buttons and 4 image controls as well as 54 LEDs for interaction feedback. A microcontroller, in conjunction with an electronic circuit of multiplexers, senses the interaction and sends the data via serial port to the computer. A Processing sketch analyzes the received information, loads the requested images on the screen and applies the transformations of position, size and rotation. The generated paradise composition will be projected in real time on a Full HD Monitor.